I didn’t have plans to watch Pompeii. Most of my Classicist friends said they barely lasted fifteen minutes before switching it off. But someone gave me a DVD. Thar she blows. Screencaps by Linnet. As a matter of fact, it’s not that bad. (The good thing about low expectations is that you cannot be disappointed.) In Yiddish terms, the film is kitsch (overly sentimental) but not schlock (poorly made). 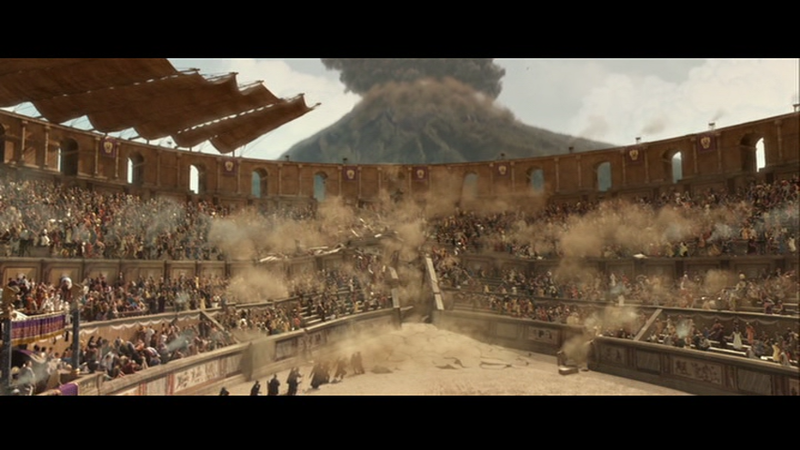 The scenes of Pompeii itself are lovely, surprisingly accurate reconstructions, and the gladiatorial fights are reasonable approximations. 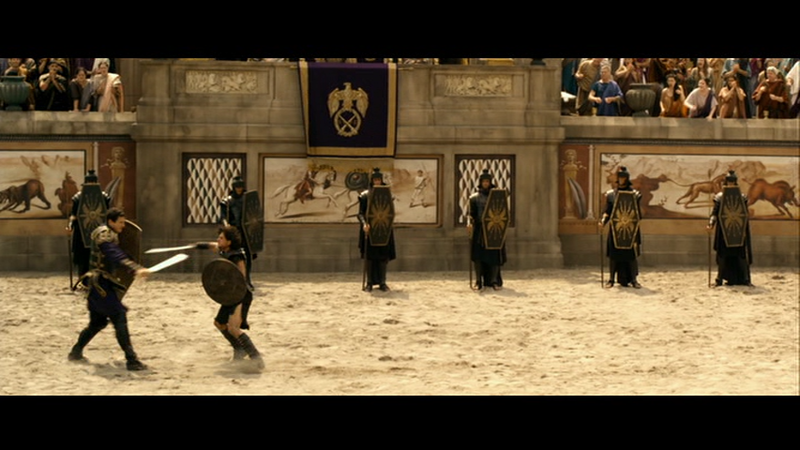 The gladiator costumes are especially good. Even odd details like the masked “Greek chorus” who introduce Senator Corvus’ bloody entertainments in the arena are at least based on something historical. The eruption of Vesuvius too is (relatively) accurately depicted, down to the early-warning earthquakes, the rain of ash and pumice, and the pyroclastic flow. The filmmakers couldn’t resist adding a spectacular rain of lava bombs for the sake of 3D. Obviously that never happened, or Pompeii would not be as beautifully preserved as it is. And the lava bombs quickly become tedious. What IS it about male directors and explosions? Of course there are some gross departures from cultural accuracy. When Corvus has his soldiers abduct Cassia, they manhandle and abuse her in a way that would never happen in real life. Cassia was Corvus’ intended bride, so any insult to her would be an insult to him. But this is typical of the writers’ approach: Corvus is basically Snidely Whiplash, a villain straight from a 1920s melodrama. As long as you accept this convention, you can enjoy Keifer Sutherland’s arrogant Roman Senator, in spite of the fact that, looks-wise, Sutherland seems to be morphing into late-career William Shatner. I confess that I longed for his papa, Donald, to step into the role. Bwahahahaha! The wicked Senator Corvus (Kiefer Sutherland). Papa Donald. Merciful heavens yes. Source: iMDb. 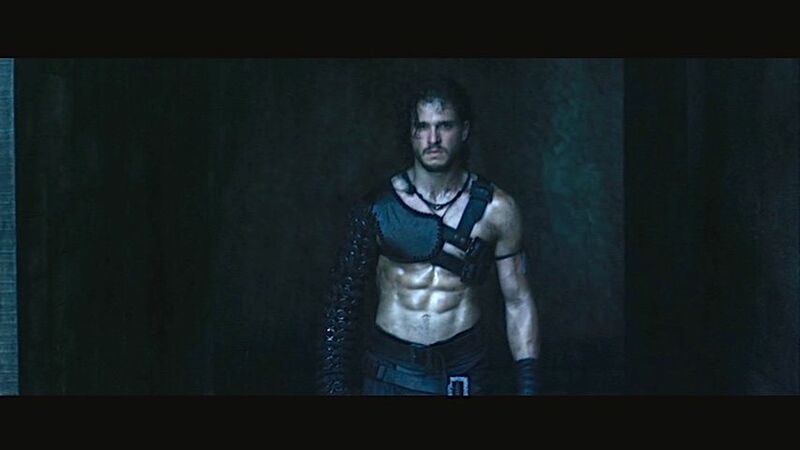 The main attraction is of course Kit Harington, who plays Milo the Celt, a slave gladiator who has a star-crossed romance with rich girl Cassia. Never mind the fact that a “Celt” bears the Greek name of Milo. Never mind that Milo has a quasi-magical ability to soothe horses, which he supposedly learned as a tot among the “Horse People” of Britannia, before they were exterminated by the Romans. Never mind that Milo has superhuman powers of endurance, given that fifteen bloody lashes to his bare back have no effect on his gladiatorial prowess, and he fights dozens of men without tiring. A little adrenalin can do wonders! Maybe I just don’t have a cougar in me. Emily Browning is well cast as rich girl Cassia. She looks pretty but peevish. I had to laugh when Cassia vehemently protested that she was “not a Roman” even though she lived a luxurious Roman lifestyle in a humongous Roman-style villa. 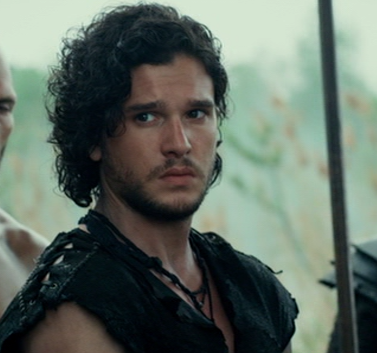 Kit Harington has very few lines, and his face remains impassive throughout. He reminds me of a young Keanu Reeves, pleasant to look at, but blank. This is why they needed the horse-whisperer strand of the plot, to endow Milo with something resembling a personality. Harington’s one great strength is his physical grace, and he excels in the fight scenes (just as he does on Game of Thrones). The famous abs. Surprisingly, they are only displayed once, in this initial fight scene. This is about as emotive as he gets, but on the plus side, there’s never a hair out of place. Still, I’m getting tired of seeing him pitted against much larger men. They keep juxtaposing him with guys like Sasha Roiz (six foot four) or Adewale Akinnuoye-Agbaje (six foot two), both of whom I found more charismatic. The character of the African gladiator (oddly named “Atticus,” which means “the Athenian”) exploits two contrasting racial stereotypes of American film: the huge, scary, violent black man, and the sympathetic black slave yearning to be free. 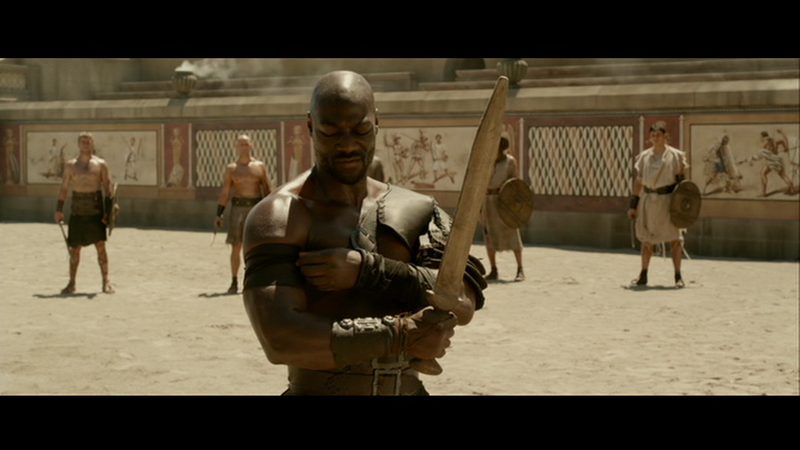 Still, Mr. Akinnuoye-Agbaje breathed life into Atticus. I just wish Atticus did not have to spit all the time. What is it with men and spitting? Adewale Akinnuoye-Agbaje is excellent in this role. And beautiful to look at. Harington is five foot eight, but he seems Lilliputian. 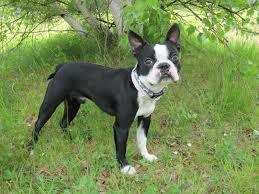 It is as though a Boston Terrier were to attack a series of Rottweilers, and win every time! Uncomfortably close to the Monty Python killer rabbit scene. With Sasha Roiz as Proculus. Russell Crowe was far more convincing in this kind of role. But I am thankful that Anderson did not mimic Ridley Scott’s favored style of cinematography, making the actors wander through a landscape of atmospheric Stygian gloom, like escapees from Wuthering Heights. They are in Italy! At least until the lava bombs start falling, the Mediterranean sun is reliably brilliant. 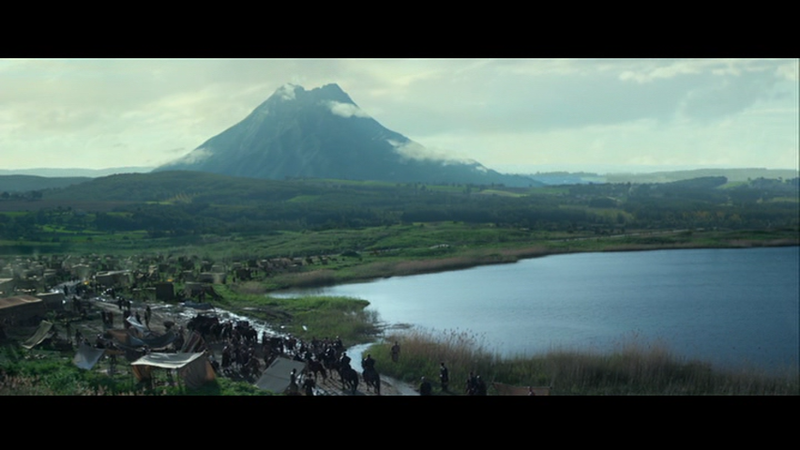 I conclude with some caps of the beautiful digital scenery, the best reason to watch this film. Cassia’s luxurious villa, on the coastline near Pompeii. Another lovely shot of Vesuvius. Nicely authentic: a street leading into the city is lined with tombs. Excellent street scene of the ancient city. As far as the stills I understood that Vesuvius did not look exactly like that before the eruption, but we can put that among the artistic licenses like lava bombing and mixed-up patronimics. To end with, once more, “The Eagle of the Ninth” I liked so much Papa Donald in the movie version. I did not know about either book or movie! I will have to look into both. As far “The Eagle” is concerned, I’ve liked very much the first half of the movie. In my opinion the reconstruction of the life of a Roman soldier in Britania in the garrison is flawless. But afterwards they’ve changed so many things compared with the novel that… well. But there’s Mark Strong, which is always a good reason to watch a movie. Indeed, they’ve not sold “Pompei” as an anthropological essay but pure entertainment, every now and then is so good to switch off the brain and let yourself go. Yes, it’s just a popcorn movie, and it reminds me a bit of old-time Hollywood adventures. 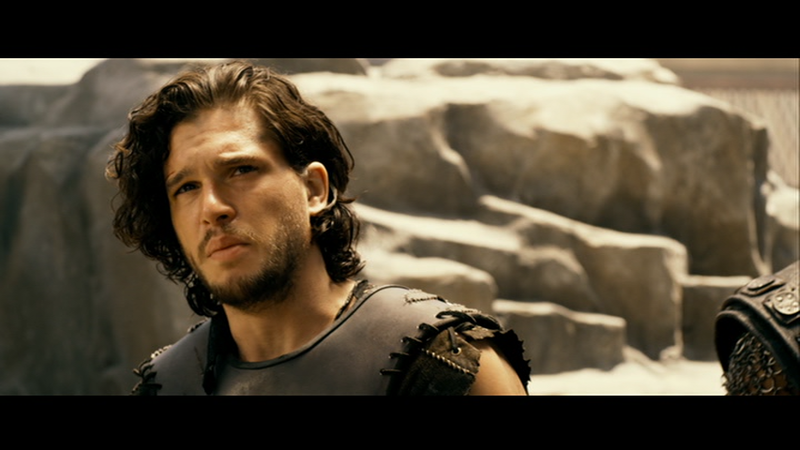 If Kit Harington was more charismatic, I would have enjoyed it despite all the clichés. I did approve of the ending. Not to be a spoiler, but nobody escapes and that is as it should be. Ah, I’ve not seen it but the cast looks amazing. I just read on Wikipedia that Ramesses survives. Is that what bothered you? That’s pretty bad!! Hariclea talked about Gladiator; the best example of how a movie that literally mocks history is an amazing and incredible piece of entertainment. Yes, I suppose in the end the history is not as important as the storytelling. Without that, there is no movie. I enjoyed the eye candy. 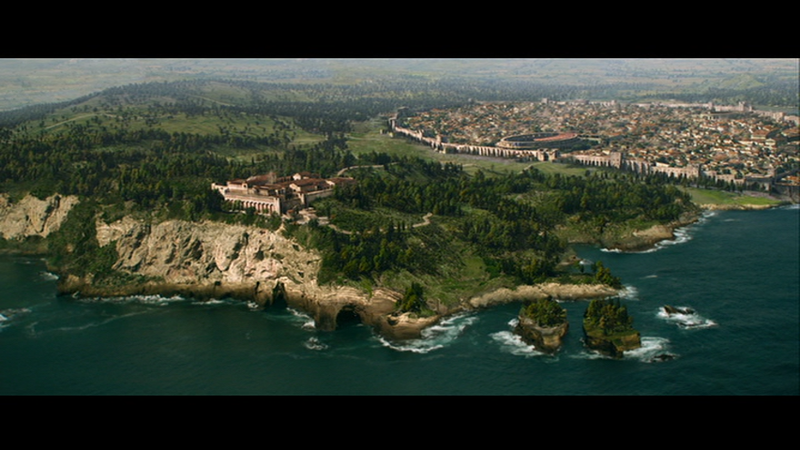 And I truly admired the art direction and the CGI of Pompeii. They did their homework on the layout of the city and reconstructing the buildings. I have to put myself in the turned off…after about 30 minutes though. It’s visually very lush, but I just couldn’t get there. It may function as a good assignment for a class on Pompeii and Herculaneum though…identify what’s accurate and what’s not kind of thing. Yes, the aerial views of the city are wonderful, and the street scenes. Also the interiors of the buildings, like Cassia’s villa. The acting in the old Hollywood sword and sandal epics was pretty wooden too, so I guess not much has changed, LOL! Lol sounds like a fun thing to watch for the ‘imagine what it would be like’ factor 🙂 Ups does KS think that frown=baddie (just as KH equals melancholic brooding expression to acting? )… and yes his dad would have made a much more credible senator me thinks. I’d still like to watch it for the costumes and street reconstructions, mass scenes etc. 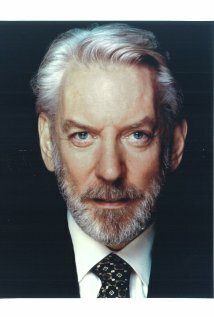 Id did love the Gladiator, no idea how accurate but it certainly was magnificent and romantic and i think RC made a credible soldier. I just don’t get KH, not in Got, not in this, don’t let his fans read me 😉 Doesn’t help he’s stuck with that hair style for as long as he will be in GOT. KS is okay, but he never really “got” me the way his papa did. What a magnificent Roman senator Papa would have made! Even the age difference with Cassia would have been more or less normal for back then. Yes, “Gladiator” was magnificent, even though flawed from the historian’s viewpoint. Russell Crowe was convincing as a big, manly gladiator in a way that KH is not. Crowe is simply a better actor. Still, Kit is very beautiful to watch in movement, like a dancer. And I don’t mind the hair. Yes, i see what you mean about Kit, hm that is true of GOT too, he is graceful to watch and moves and looks quite princely which works very well for that role too. I miss seeing something substantial from Crowe..
It’s been a long time since I saw Gladiator, but several people have told me there were many echoes, and that Kit tried to imitate Russell Crowe (LOL). The standout for me was Adewale, really a beautiful man. Haven’t seen the movie, but I love the snark in your review.